There’s that saying that the only thing constant in business is change. 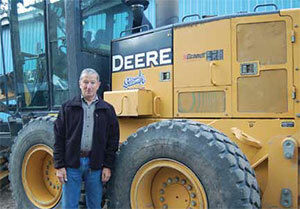 Derek Stamer and his son, Ward, of Stamer Logging in Barriere, B.C. know all about that. Derek Stamer (below) is quick to point out that the company’s almost half-a–century of longevity has been due to the efforts of his employees, and his son, Ward (left), who joined him in the business some 32 years ago. 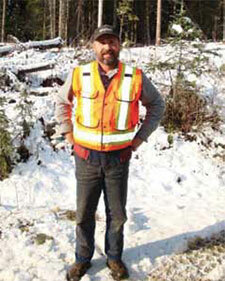 Ward now handles the logging, safety and environmental side of the business, and Derek looks after the roads. In the close to 50 years Stamer Logging has been in business, it has been pretty much a conventional cut and skid operation. It changed over the years, in that they moved to mechanical harvesting. But now they’ve changed again, and have moved to doing some high lead logging, a technique that’s seen far more use on the B.C. Coast, than in the B.C. Interior, where they operate, logging for Tolko Industries, based in Vernon, B.C. Being a B.C. 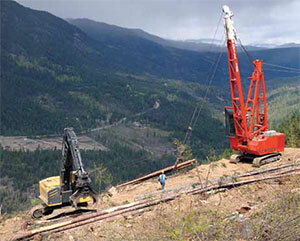 Interior logging contractor, Stamer Logging did not have experience in high lead operations. But they were fortunate to find two experienced high lead operators to come on board. “We were also very fortunate in that we have two very experienced fallers—that’s pretty hard to find these days in the Interior,” says Derek. Stamer Logging got into high lead in a small way, then went bigger. “We had a mini tower set up on one of our excavators, and that was fine, but it was like watching paint dry compared to a full-sized tower.” So they purchased a used Madill 120 swing yarder, which had been parked for a couple of years. And Stamer Logging continues to be well-positioned in terms of overall equipment. Despite the downturn, the company continues to purchase about three to four new pieces a year, representing about 10 per cent of their 40 piece equipment fleet. Like all logging operations, they’ve been keeping equipment longer, and trying to get the most out of it. This involved complementing their existing heavy duty mechanic with an additional heavy duty mechanic. And they’ve made some changes to their supply sources. “We had a former serviceman from one of the major equipment dealerships set us up with a whole bunch of different supply lines and sources, and we changed some other things, and we’ve been able to do some great stuff with our older equipment, to keep it running. “We used to trade in the bunchers every three years—but now they are up to 20,000 hours, and they don’t miss a beat,” says Derek. 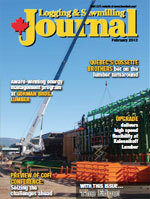 As noted, Stamer Logging still buys new equipment, but they are more selective about what they buy. But Derek noted that the logging industry—through the efforts and investments of logging equipment manufacturers—has been the beneficiary of some pretty significant equipment advances and improvements over the years. The improvements now seem more incremental, than revolutionary. The Stamer’s are pretty happy with the performance of their equipment, though, which is Tigercat on the buncher side, from B.C. dealer Parker Pacific, and John Deere equipment in all other areas, from Brandt Tractor, both of which are long term relationships. On the buncher side, they like the fact that the Tigercat equipment is purpose-built. In addition, they also have 10 Western Star logging trucks, to do their trucking. Although the industry has gone through some very lean times, getting through this last downturn has meant that logging contractors have to be on top of their game more than ever. This is especially so when it comes to costing out equipment. “That’s something we have always been big on, but especially the last few years,” says Derek. “We have someone who comes in part time, and he’s exceptionally good on the computer. We provide him with the figures, and he comes up with pie charts showing the percentages the skidders worked, the percentages the bunchers worked, what our costs were and the rate we were paid. He’s done a great job. “So we have base models for just about every type of logging application—high elevation, easy going, tough going, high lead, whatever. We don’t track every single block like that, but we do have a base for it.” Having their costing at hand especially helps when it comes to negotiating logging rates. He noted that the industry has lost people to the oilsands in Alberta, and the lure of big money. But he added that the grass is not always greener in Alberta. “A few years’ back, we had five good operators leave. Within six months, three of them wanted to come back—they were away from their families and they weren’t used to the odd work schedules.” Derek says he is fortunate in that he can offer steady, full time work. “We have a lot of long term employees.” Some of their truck drivers have been with the company for 30 years. Derek is quick to point out that the company’s longevity has been due to the efforts of his employees, and his son, Ward, who joined him in the business some 32 years ago. 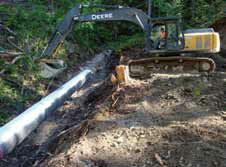 Ward now handles the logging, safety and environmental side of the business, and Derek looks after the roads. “I like that,” he says. “We look after most of the roadbuilding and road maintenance for Tolko in this area, so it’s full-time work for me.” They usually build around 35 kilometres of new road a year, and rebuild another 35 kilometres. And building new road, of course, is key to getting access to timber. They have eight pieces on the roadbuilding side, everything from excavators to graders, all of it John Deere. For the time being, the operation is looking for a bit more clarity in terms of what it will be doing in the future. And he knows that complete certainty is not going to be there, and that rolling with change is the best way to go. A contractor could have a five year business plan, but it had better be a rolling five year plan, subject to change.